I will be the first to admit that pickling radishes sounds a little weird. Zucchini is one thing, it at least looks like a cucumber. Radishes are a whole different story though; they’re small, weird and funky. I am game to try any dish once though, and luckily I had a small bag of radishes on hand. The truth is they turned out pretty good. I am not sure if I am a 100% fan of the flavorings, but the radishes do pickle really well. 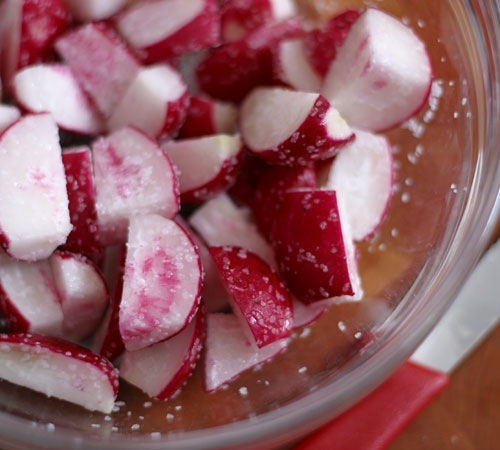 I definitely want to try pickling radishes again, but I might try another recipe. This one was a little sweet and I think a spicy one might be a little better. The search is on! 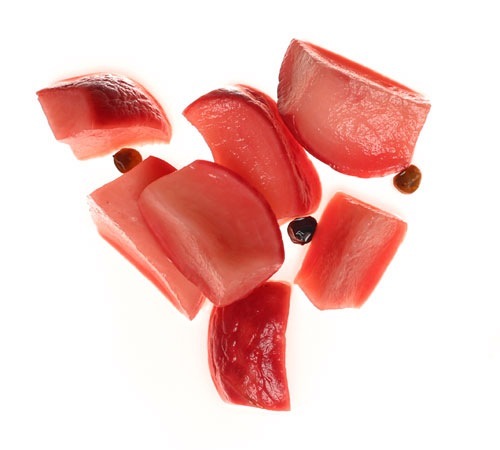 One fun thing about this recipe is that the radish skin turns the pickling liquid red! Trim the tops and tails of the radishes and quarter them lengthwise. In a large, nonreactive bowl, toss them with 1 tablespoon kosher salt to coat well. Add water to cover and several ice cubes. Set aside until the radishes have softened slightly but are still crisp, about 2 hours. Alternatively, transfer the salted radishes without the water and ice cubes to a Japanese pickle maker and screw down the top. While the radishes are softening, toast the mustard seed and black peppercorns in a small saucepan over medium-high heat until they are fragrant, about 2 minutes. Add the vinegar, one-half cup water, the sugar and the remaining one-fourth teaspoon salt and simmer 3 to 5 minutes. Remove from the heat and cool until the pickling mixture is just warm to the touch. Rinse the radishes well and pat them dry with a towel. Place them in a small, nonreactive container and pour the warm pickling mixture over them to just cover. Seal tightly and refrigerate at least 1 day to mature. Love finding new sites that still have people making their own pickles from their own garden veggies………..LOVE IT! Sadly there are many who only think cucumbers when thinking pickles – limited thinking and missing out on all of the delicious pickles. The man has a bumper crops of radishes, we’ll be pickling them tonight !!! I’d like to invite you to have a look on a funny home-made decoration – the radish mouse on cold spread. Radishes are wonderful when they are just sliced and layered on Pumpernickel Bread, and salted. Their peppery flavor pairs beautifully with the strong flavor of the bread. Some recipes call for buttering the bread first. Personally, I like plain with salt best. Pickling radish sounds like an inspired idea. 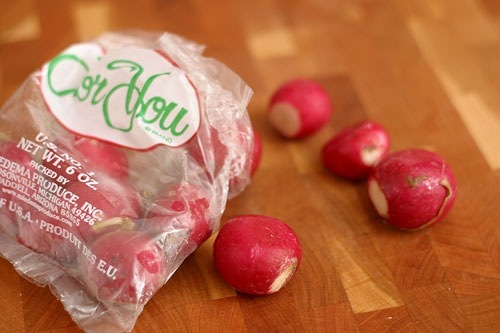 I’ve only just discovered these red radishes and they’re divine!